I always wanted to fly with this airline especially the A330 on this route. It was either this or China Airlines as I wanted a new carrier for my flight logbook. I did some checking with the prices and TransAsia's was just right for me. I paid S$459 for the return ticket, almost the same price as my Vietnam Airlines return trip to Taipei. This was a good deal as for the first time, I was flying there in the morning and returning home in the evening, the flight timing was much better than my previous flights to Taipei. 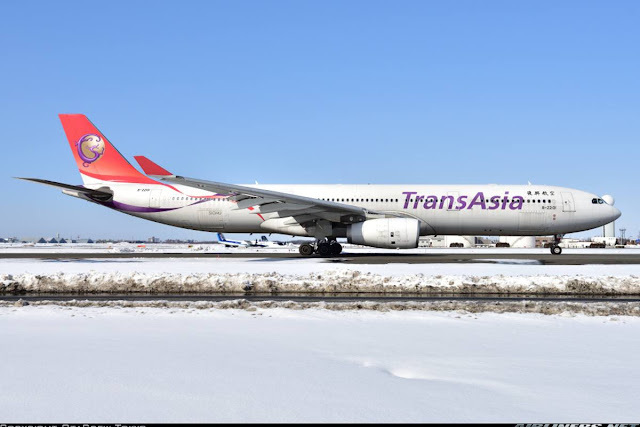 Later on, TransAsia announced that the airline would be cancelling flights to Singapore, its last official flight out of Singapore would be on the 25th September but the airline would operate a few more flights in October before ceasing operation for good. It was a sad news for both Taiwanese and Singaporean Aviation as one less carrier to Taipei. For this trip report, I will be combining both trip sectors as I wasn't able to take much photos on the outbound due to the ridiculous "no photography" policy on board TransAsia flights. The only Taiwanese airline that had no such issues was EVA Air/Uni Air. Not sure about China Airlines and Mandarin Airlines, the others were very particular about taking photos on board, which I have no idea why. I had work in the afternoon and it was pretty tough for me to get the day passed quickly. But once that was over, I headed home straight, did some last minute packing before making my way to the airport to meet some friends. Initious aka Daniel and his friend were at the airport so I met them at the TransAsia check-in counter later on. The check-in counters were not opened even though it was 2 and a half hours before departure, the queues were long and later on, when the staff opened the counters, a group of "country bumpkins" came and cut queue, that angered a lot of us including 2 Caucasian guys who shouted at them. Amazingly, no one from the counter came and calmed the passengers down and got the queue in order. Thanks to my friend, Kenny who spotted the lack of queue at the business counter, I made my way there and check-in. The counter lady was understandable with the current situation and allowed me to check-in without any further question. Once that was done, the folks in the queue including the Caucasian guys looked at me in disbelief but they knew I was not at fault. This was terrible, considering Changi Airport is supposed to one of the top airports in the world - it was a combination of PR disaster and the ugly behavior of passengers that made this check-in experience an absolute nightmare. Anyway, once that was done. Daniel and his friend went into the air-side, while I went with Kenny and the others to have a drink before bidding farewell to them. This was where the problem started. 2 and a half hours before departure of flight, counters were not opened yet. No separate queue for web check-in passengers. Pretty messy later on. At this point. many furious passengers were angered by the passengers that cut the queue when the counters were opened. Confrontation with them, but in the end these "morons" checked-in ahead of us. Got my boarding pass not long after, quite nice! This check-in experience was probably the worst I had ever experience at Changi Airport. It was so disorganized and the worst thing about it was not even an airport staff came to do something about it. Those ugly passengers were the winners, they cut the queue when the counters were opened and they got checked-in ahead of those who queued up. Was it fair? You guys decide for yourselves. At the air side, I went to Cadele cafe to meet up with Daniel and his friend, Adrian. Had a brief chat on our trips before I made my way to my gate. I was looking forward to fly on the GE's A330-300 B-22101, the first of two A330-300s in its fleet. 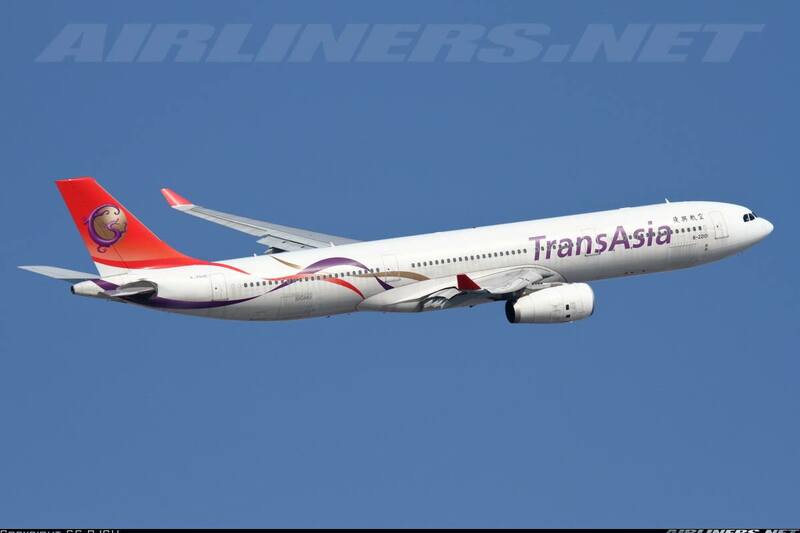 TransAsia has only 2 A330-300s and the airline flies them to Sapparo, Bangkok, Asahikiwa, Kushiro, Hakodate and Bangkok. At this time, the airline would be flying to Singapore for a week before canceling the route altogether. At the gate, there were many passengers were already waiting inside the holding room. I could sense the tension between between the Caucasians and the "country bumpkins" but luckily, nothing happened. Boarding started not long after and a long queue was formed. I boarded the aircraft about 0030 hours and made my way to my seat, 41A. Fortunately for me, the seat beside mine remained empty and the rest of the seats were all filled up probably by a group from a tourist agency. I started doing my routine work and that was to take photos of the cabin as many photos as I could. Unfortunately, a cabin crew (probably the in-flight manager) came to me and told me not to take any photos and I had to delete them. It happened to me before on my Far Eastern Transport flight but didn't expect this TransAsia to be strict with photography as well. I pretended not to take any more, hoping that she would just move on but no she insisted me to delete the photo in front of her. (CRAP!) Had no choice but to oblige to her request and only then she left my seat. My mood by then was gone, as I didn't want to make my trip worse so I took very few photos later on during the flight. The J Class seats certainly looks attractive. Not satisfied with the crew to be honest. The seat is comfortable and legroom space is reasonable. The comfortable 2-4-2 layout is my preference over others as it means lesser people on board (comparing full flights on other aircraft type) and no middle seat for anyone. The chances of having an empty seat beside mine is higher especially if the flight is not full and luckily for me, my seat remained empty not just for SIN-TPE sector, the return one as well. So that means more legroom space for me. What was inside my seat pocket? Scoot also flies on this route about 10-15 minutes after my flight, but ours landed later and I noticed from the flight map that we took a longer route. It didn't matter for me anyway since landing at around 0530 didn't make any difference for me as my hotel room was only available from 0800 hours onwards. Once the aircraft's doors were closed, pushed back took place about 15 minutes later. Safety video was played on the PTVs while the aircraft's engines were started up. The aircraft taxied to runway 20C for a powerful take-off to Taipei! It was great to be flying again after 2 months of hard work! During this flight, the seat-belt sign was off just for a short while. My observation when flying on Taiwanese carriers is that the flight crew tend to be stricter than the others. Even small little bumps, the flight crew were turned on the seat belt sign almost immediately. But for this flight, it was left on most of the time. Even so, during smooth air, passengers were allowed to use the lavatory. Anyway, there was a "ding" sound, that was to notify the crew that they were allowed to start work. One thing about this flight was that since it was flying at such an ungodly hour, not many passengers would want to have their meal. True enough, when the meal was served, most of them oped to sleep. As for me, I had a choice between porridge or chicken noodles. I decided to have something light and this was what I had. The porridge was average, neither bad nor good. I chose this because I wanted something light before taking a short nap. I preferred the guava and fruity bean curd as they tasted better than the porridge and that's for sure. After the meal, the cabin lights were turned off and it was almost pitch black except for a few PTVs. I managed to catch an hour of sleep. A mild turbulence woke me up from my slumber but it was nothing bad. The rest of the flight went uneventful but we landed late at Taipei about 15 minutes passed the schedule time. The weather in Taipei was fabulous, flying in was very smooth. I got to experience the Taiwanese service about 10 times before my flight and this flight was nothing spectacular. The crew in general were alright, they did their jobs professionally but without much warmth and friendliness. Its like having being served in an inexpensive restaurant. Comparing the service I had with EVA Air and this airline (both flights);I would have to say the service on my TransAsia flights gets my vote, but just by a slight margin. Leaving Taipei was one of the toughest things to do, not just Taipei, as long as it was flying back home, it was really tough. I wasn't looking forward to go back as my heart seemed to have settle down in Taipei. My original plan was to return home on the same date as Daniel aka Initious (Airliners.net user), but I could only extend a day after but I didn't because the aircraft scheduled the day after was an A321. My rule of flying was simple, no narrow-body (except for 757) for flights more than 3 hours, and didn't want to get feel cramp on board a narrow-body for this duration. Maybe this rule may change in the near future, who knows? For the first time, I was departing in the evening, that means that I could spend at least half a day doing some last minute visit at certain places before flying off. I woke up at around 10.30 am, checked out but left my luggage at the hotel until it was time to head to the airport. I went to Ximending to have lunch at a restaurant, but the service was so slow. Wasn't impressed even though the meal was good. (Sorry, no photo). After that, I went to grab some dessert before heading back to the hotel. Reluctantly taking my luggage from the hotel, I dragged my feet to the bus stop beside Sheraton Taipei Hotel and took the bus 1961 to the airport, it cost me only NT$90 for the one hour journey. My flight was at 6.55pm but I left the hotel at 3, reached the airport around 4. Once I got to the airport, the TransAsia Counter was still not opened, no early check-in counter - that's a disappointment. So I waited for about half an hour before the counters were opened. This time, no mess like my outbound check-in. Check-in was swift and before I knew it, I was at the air-side. Immigration only took me around 10 minutes and security was fast too. What I like about going through security compared to Singapore is that you don't have to take out your Ipad or laptop, everything will be scanned through the X-ray machine. Was surprised to see this prayer's room. I should have gone in to have a look. After doing some exploring, I headed to the gate and rested for a while. Checking the aircraft's registration, I was slightly disappointed to be flying on the same one, B-22101. With a fleet of 2 A330-300s, its not a surprise anyway. Spotting registration of aircraft from this angle is easy, either check out the side of the aircraft (near the first door) or at the nose gear. Boarding started not too long after, apparently this flight's load was light. 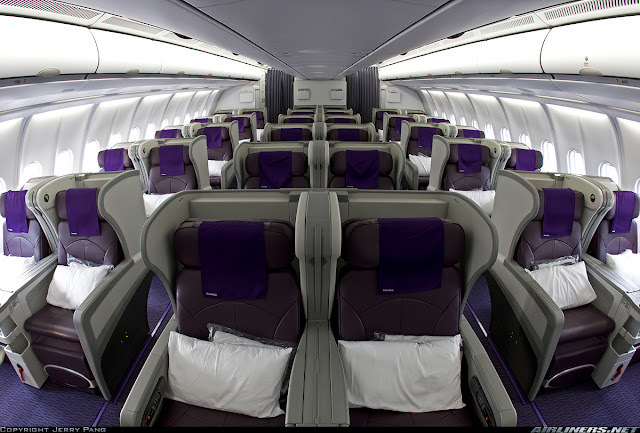 Only 2-3 business class passengers boarded and looking at the number of Y class, I am looking at a number of less of around 100 passengers - pretty light load for the A330. Thanks goodness, the aircraft didn't downsize to A320 or A321. Maybe the return flight was more packed, who knows. This set of crew was more friendly than my previous flight. I was greeted with smiles and was shown to my seat. That's a positive start to my flight! The last cabin was to be mostly empty and of course I had the seat beside mine empty. The aircraft door was closed about 10 minutes early, however we only pushed back 20 minutes later due to cargo. Cargo door didn't close until about 2 minutes before pushed back. Usual aircraft routine began and soon we taxied in the dark and took off quickly, heading south-west to Singapore. The crew on this flight would have an easy job tonight, as there wasn't many passengers to take care of and also would get to stay in Singapore for a night before returning home on the next day's flight. I had a choice between this or the Chicken. It doesn't look too appetizing right? Well yeah, it didn't taste that nice either. I was quite disappointed with the Taiwanese catering this time round. After the meal, I spent the rest of the time, watching some movies. However, there wasn't many choices and they were the same as my outbound flight. I thought the movie choices would change since its a different month, but I was wrong. Anyway, flight was quite smooth and before I knew it, the plane started its descend and we landed on runway 20C and headed to gate E20 of Terminal 2. This time, the flight landed on schedule. Being said, that marked the end of my wonderful trip! The on-ground service at Changi left me with a very bad impression. Singapore Changi Airport is one of the top airports in the world, but I feel that service not just at the airport has been on a decline and if you ask me. I prefer Changi Airport of the past especially during the era when the old viewing mall existed. The old viewing mall was large in the past, you can view both cargo apron and the runway (02L/20R), those were the golden days of Singapore aviation. Service back then was better too. On a positive note, Changi Airport is still a good airport for transit and flying out of. Depends on your luck though! Anyway, flying on TransAsia, my experience overall is a positive one. Cannot match with the likes of JL,SQ,CX ...etc and there is room for improvement for the airline if it intends to be more involved in other markets. Its a pity that this airline will no longer by flying to Singapore due to strategic reasons. I will definitely miss this airline, hopefully the airline will restart flights here in the near future. One advantage this airline had over China Airlines and EVA Air was the flight timing, much better than the other airlines, but due to the lack of connection (small network and lack of partners), this airline lost out a lot. I hope this airline would lift the "no photography" rule and improve its current network (expansion) and in-flight service and do better in the near future. Best for beginners and pro's too.